The sixth GOP debate is tonight, and there will only be seven candidates on the main debate stage. That may seem like a lot, but the field has winnowed considerably in recent months. The debate will take place in North Charleston, South Carolina, which happens to be a pretty important primary state — the next one up for voters after attention-stealers Iowa and New Hampshire. And yes, there will still be an undercard debate, even though the idea of one becomes less and less palatable as it becomes increasingly clear which candidates have absolutely no chance of being president. Senator Rand Paul and Carly Fiorina were both demoted, but Paul is so incensed that he has decided to not take part in a debate that no one will watch and instead will try to win over votes one by one in Iowa or New Hampshire. 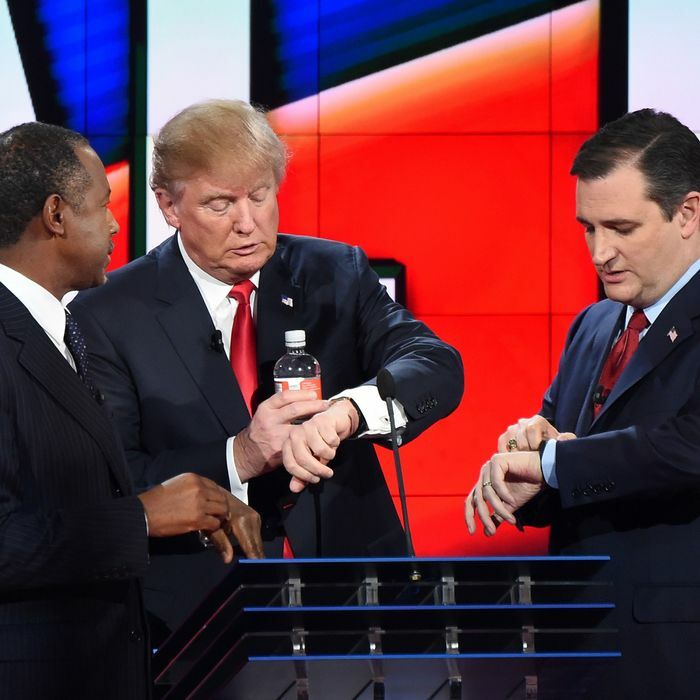 The prime-time debate will start at 9 p.m., the kiddie-table debate will begin at zzzzzzzzzz … hmmm, what? Oh, 6 p.m.
Daily Intelligencer will be watching both — you can follow our thoughts below. Tune in at FoxBusiness.com.